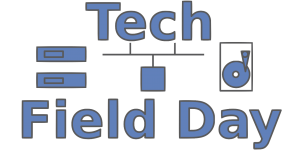 Last year I had the honor to be invited to a few Storage Field Day events, one of these being Storage Field Day 16. During SFD16 in Boston, we had the opportunity to get an update on Zerto and the innovation they’re releasing on their software product. For those who don’t know Zerto, they are a software-only company that empowers their customers to replicate their virtual workloads between data centers, be it on- or off premises. Zerto started as a company in 2009 and came to market with a focus on VMware virtualization in the beginning. These days you can use Zerto for VMware, Hyper-V, replicating to on-premises secondary DC’s, as well as local ISP’s or public cloud offerings like Microsoft Azure, Amazon Web Services or IBM Cloud. A very impressive list if you ask me! In a vSphere environment a Zerto ZVM is installed per vCenter to manage the Zerto platform as well as a VRA per ESXi host. The replication is done through block-level replication between the two sites through the vSphere Replication Appliances (VRA). When a disaster occurs the VM’s failover to the other side, and the company will lose little to none of its valuable virtual workloads. Possibilities are much wider than just DR, as Zerto can be used for application migration as well, an extra that can be even better leveraged after the introduction of VPG’s. 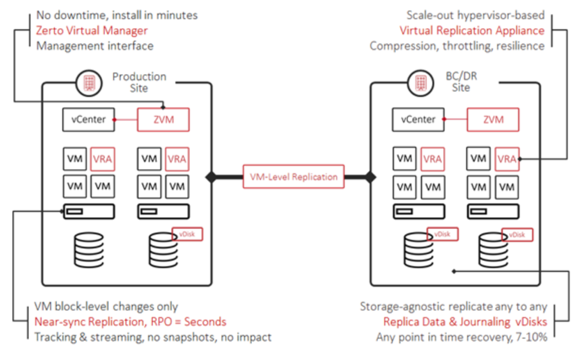 The VPG (Virtual Protection Group) technology gives companies the option to group VM’s together as well as prioritize VM startup behavior and the possibility to move (replicate and thus migrate) between VMware and Microsoft Hyper-V. Other options to migrate to are public cloud offerings like Microsoft Azure, Amazon Web Services and other cloud provider (Zerto partners). This really makes Zerto one of those special companies that offers extra value for its customers. Add in that there is little to no impact on the production (and BC/DR) site during installation and offering continues data protection with the possibility to have near zero RTO/RPO options, makes this technology even better. IT Resiliency is bringing it all together. 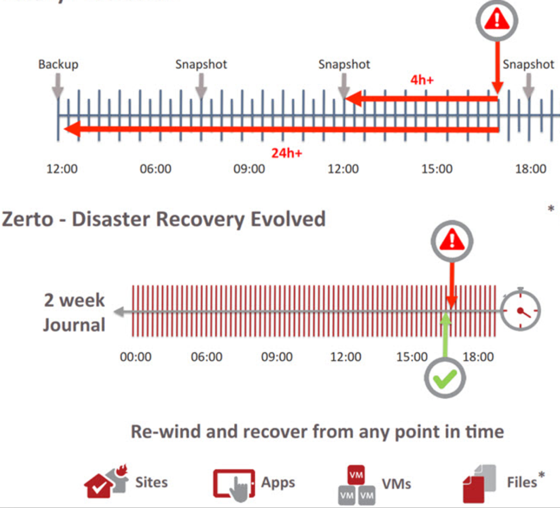 So Disaster Recovery, which is the foundation Zerto was build on, Migration functionality was an awesome outcome of the well designed and executed Zerto technology as now the backup and recovery possibilities. This is where Zerto has technology that is key for their customers and thus offers them an edge to competitors not using this technology. For further information I would suggest to check out the presentation Zerto gave at Storage Field Day 16, as well as the excellent blog posts written by the other delegates. With over 15 years in IT Arjan has gained a lot of experience in the virtual DataCenter. These days, as a Principal consultant for Metis IT his focus is on the Software Defined DataCenter and helping consultants and the company grow in this fast changing world. Through his blog which can be found at VDIcloud he’s been awarded with the VMware vExpert title multiple times. And as of 2016 his new blog SDDCinfo he’ll focus more on on the Software Defined DataCenter.